Holiday time isn’t always a happy time for everyone, especially for those in need or far away from family. This year, Palmyra High School senior Maddie Hartman sparked an idea that will make Thanksgiving a little easier for Burlington County residents who find it difficult to have a celebration of their own. Stuck on what to do for her National Honor Society project, Hartman approached her softball coach and history teacher, Ken Miller, for guidance. 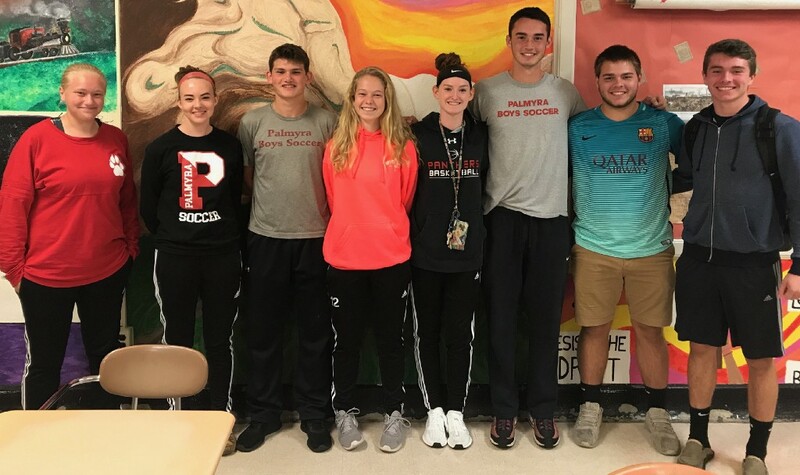 After some brainstorming, Miller and Hartman pulled together a few other students to host a community dinner Nov. 23 at the Christ Episcopal Church in Palmyra. The combined efforts of Hartman, seniors Chelsey Deacon, Hulianna Blatz, Maddie Conroy, and Tommy Shover and junior Matt Katella have yielded gratifying results. Miller and the students worked with Burlington County churches and food pantries to find out what goes into planning a community dinner. Miller and his team are prepared to feed about 100 guests after consulting with churches and pantries that do this kind of volunteer work regularly. And thanks to donations from the community, Georgetti’s in Cinnaminson and local Acme Markets, there is plenty to go around. “Georgetti’s is providing us with sides for free, and then we got $100 in gift cards from Acme, which we’re using to buy turkey,” Deacon said. The dinner will include mashed potatoes, macaroni and cheese, and, of course, turkey, all served buffet style. “In regard to the numbers we get, whether we get 100 people or 20 people, it will be people who wouldn’t otherwise get the dinner they deserve,” Katella added. Right now, Miller said they are receiving a decent amount of donations, but in the coming weeks, additional fundraising, such as dress-down days for teachers, will help the team ensure everyone is fed. Interact, a community service club at the high school, is cooperating with Miller and his small student team to assist with their ambitious undertaking. The Thanksgiving Dinner will take place from noon to 5 p.m. at 638 Parry Ave., one block down from the Palmyra Riverline Station. All are welcome to attend.